We at male2Man want to provide you with great content about biblical manhood. We fully realize that we don’t have a corner on the market. So, when available, we also want to provide you with all the resources that we possibly can. Additionally, the co-creators of this site believe in the biblical mandate to “go make disciples” (see Genesis 1.28 & Matthew 28.19-20). The three of us work for a seminary that also believes in the command to make disciples. Some people have suggested that it is the responsibility of the local church to make disciples, not necessarily the role of a seminary. The following article is written by a pastor who also happens to be our friend, Matt Rogers. Matt is clear and right on target when he writes, “The responsibility for making disciples does not rest with a denomination, a state convention, a seminary, a parachurch organization or a pastor and deacon board. The responsibility is given to all of God’s people in and through His church.” Enjoy! 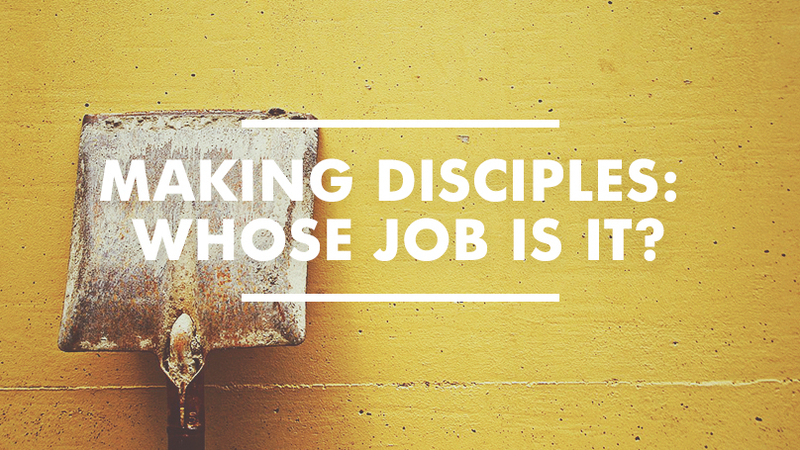 Making Disciples: Whose Job Is It? From the cry of Adam in the Garden to the appeal of a pre-adolescent boy attempting to divert the discipline of his father, fallen humanity has been marked by the propensity to place blame where it does not belong. Blame shifting is the result of sin. Adam blamed the woman for giving him the fruit and God for giving him the woman (Genesis 3:12). Eve, likewise, blamed the serpent for its deception (Genesis 3:13). God, on the other hand, blames those who are rightly responsible for the sin and negligence. Adam and Eve were given the Word, capitulated to sin and were cursed by God as a result of their actions. It was not someone else’s fault. They were to blame. Churches face the same temptation. They have been given God’s Word and entrusted with the task of making disciples of all nations (Matthew 28:19-20). This assignment was given to all of God’s people, His church, as an authoritative command by a sovereign God. There is no question who is responsible. The refrain of the Garden echoes through the halls of our churches. It’s always someone else’s fault. The refrain of the garden echoes through the halls of our churches. It’s always someone else’s fault. We have become masters at diverting responsibility and placing blame. Everyone is to blame except the one who is actually responsible and who will ultimately be held accountable. This makes life easy, right? We can expect other people to do the work with which we are entrusted and blame them when the work is not getting done. To this Jesus says, “Why do you see the speck that is in your brother’s eye, but do not notice the log that is in your own eye? Or how can you say to your brother, ‘Let me take the speck out of your eye,’ when there is the log in your own eye? You hypocrite, first take the log out of your own eye, and then you will see clearly to take the speck out of your brother’s eye” (Matthew 7:3-5). The responsibility for making disciples does not rest with a denomination, a state convention, a seminary, a parachurch organization or a pastor and deacon board. The responsibility is given to all of God’s people in and through His church. To bemoan the shortcomings of evangelical institutions while failing to personally make disciples is to point out a speck while missing the log. According to Jesus, we must remove the log. But how? Repent of your own personal negligence in disciple-making and beg God to break your heart afresh for the broken, wounded and wayward in need of intentional investment. Commit to take spiritual responsibility for one or two other people through your local church and walk with them as you seek to obey Jesus’ teaching. Develop an intentional plan for meeting with these people to study the Bible, pray and grow in grace together. Seek help from the pastors of your church as you develop a plan for walking with these individuals. Celebrate the stories of growth and transformation regularly that result from these efforts with the gathered church. Challenge those you are discipling to multiply these efforts in the life of one or two other people. Pray that God would use your personal efforts to infuse your local church with a passion for disciple-making. Sure, it seems like a small beginning. But this is the way God’s Kingdom works. The mustard seed of the gospel falls on fertile soil and springs up to produce fruit that far exceeds its size (Mark 4:1-34). Disciples who make disciples result in churches who make other churches, which, in turn, hastens the day when Habakkuk’s promise will be realized and “the earth will be filled with the knowledge of God as the waters cover the sea” (Habakukk 2:14). The responsibility starts with you. A great article on discipleship. I teach Bible Study in a women’s faith-based prison. Half of the 18 women were “Saved” before they came to prison. We can argue if their salvation experience was real. All I know is that none of these ladies had a mentor and none have ever done a Bible Study before. They all know God put them in prison to get their attention and they are so hungry for the Word. I thank God that He answered my prays to know Him. I am thankful for a pastor who discipled my husband and me. If I had not been taught I would not know what the Bible says about mentoring. I am also thankful for the excellent mentor God gave my son in answer to our prayers and Drew’s prayers.